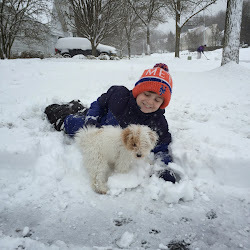 Your Dog Might be Better Than Mine | Daddy's in Charge? I sometimes feel like I am failing as a dog owner. How much am I supposed to be doing with her? She gets to go out for walks, fetches toys that I throw, and gets treats when she sits or rolls over, but I feel bad that I am not doing more. Should I be enrolled in a puppy and me class? Should I be setting up doggy playdates for her? I can't really take her to a park and let her go on the playground, so what more am I supposed to do? There are no doggy museums that we can go to. Movie theaters are off limits. I can't take her to the mall. Grocery shopping? I'm pretty sure unless I am blind, they don't look to kindly upon a dog walking through the produce section. She's three months old now, but I am concerned that all of the other dogs are passing her by. Certainly I am missing out on something. I see all of these dogs on TV doing flips, walking on tightropes, and catching frisbees. My dog doesn't do any of those things. She chases the same toy that I throw over and over and over and can never get enough of that. I've seen dog shows on TV where dogs march in perfect unison with the most perfectly groomed fur. Mine always looks like she has just woken up with a sever case of bed head. Give her a bath and she looks like a rat, not quite up to Westminster potential. Drying off after a bath. Maybe I'm over-reacting to things, but it seems that everyone's dog can do so much more than ours. Your dog might be better than mine. All our dog does is constantly lick our faces and curl up on our laps to fall asleep.